Jen's Cup of Creations: Want to win some Unity? This drawing has now ended...thank you! and she said 'no', just do something with it (see...this is how the Unity family is...terrific!). I decided to give the extra stamp set away on my blog to one lucky person TODAY! What stamp set, you ask? to get Comfy Cozy and relax. We ALL need to take care of ourselves! on Sunday by 5p (AZ time). That's how easy peasy I am! Your card is just beautiful. You are going to make one stamper happy when they win this set. Don't add me into the giveaway!!! You know I love love Unity, but I have that set. Congrats on your winnings, and how sweet of you to play it forward to all of us. I so agree that Unity is THE BEST company for customer care and service ... and their products ROCK! I do not have this set, although it is on my wish list! That couch just screams to sit down and sit a spell. Thanks again for your generous giveaway! How sweet are you, Jen? I have always loved this set, but never purchased it! Thanks for the chance to win! I make sure to make crafty time for myself EVERY DAY. Soooooo important to have time for yourself. My boys know when it is "mommy" time. I tell them that it is time to play with their toys or watch a show and that mommy is doing her "work". They seem to get it, too! Yes, the Unity family is definately amazing!! I love your card...that pink paper is PERFECT for the couch! Ah, an hour just for me...I can so do that! Congrats on your winnings! TFS! I would love to win this set! The relaxing part...I think I could handle that, too! Aw, Jen, how sweet of you! 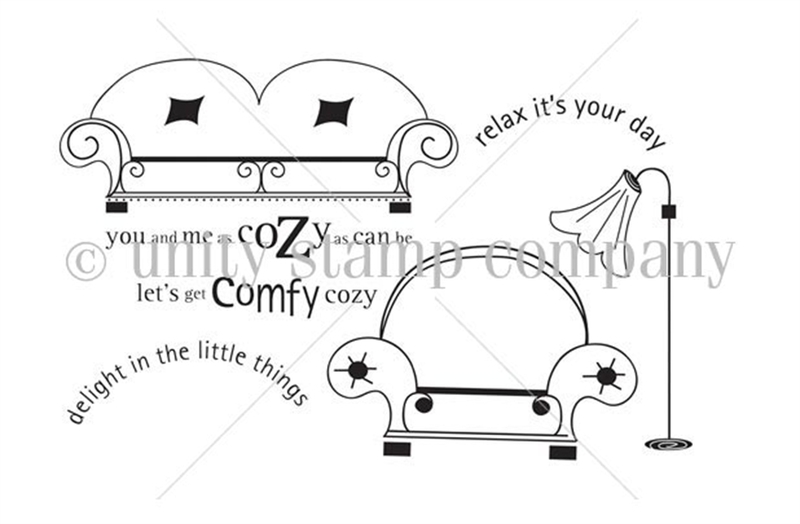 Love your card and your encouragement to take some time to be comfy! I gotta agree. Unity is such a fantastic company!! That's one reason I'm always using their stamps. Well, and the quality, of course! That is such a super cute card!! I love how you coloured the lamp and the paper piecing on the sofa is darling! Don't count me in the drawing - I've got this set!! Hi Jen, you make lovely cards!! And this card looks really cozy, I love the colours and the cute lamp - it's like beckoning someone to sit on the couch. Gorgeous! Thanks for your lovely comments on my GIU week. Really appreciate them. Have a great day! your card is so sweet and so are you, jen! love how you did the light shine, i tried that...once:) didn't turn out as nice as yours! Oh, that's soo sweet, you are giving this away! I'm having my cozy hour right now, watching the Dutch So You Think You Can Dance, which I love!! And meanwhile hopping around the blogs, my favorite way to spend the evening!!! 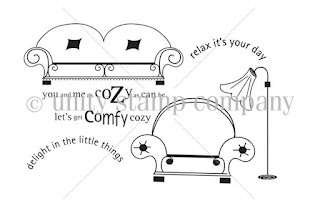 What a nice card you made with this set, so cute this couch and that sentiment! Thanks for the chance & wishing you a wonderful evening!